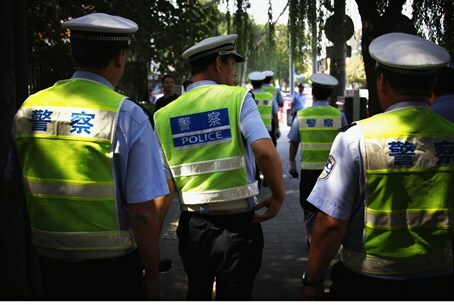 Fearing the demonstrations have started to get out of hand, China moved in to restore order. The Chinese government, while still maintaining the campaign against Japan in the media, has begun to clamp down on the popular demonstrations that it had itself stirred up and encouraged, by vindicating the demonstrators and connecting the current territorial dispute with the Japanese to the Japanese occupation of China that began in 1931. The demonstrations were beginning to do China diplomatic harm. A key incident was the assault on the vehicle carrying US ambassador to China Gary Locke. Demonstrators baited the ambassador with calls for America to return to China $1 trillion in debt that the United States owes China and chanting "down with American imperialism". In other words, although the Japanese Embassy was close by, this was not a case of mistaken identity. The mob was acting upon a secondary theme in the anti-Japan campaign that viewed Japan as Washington's talking horse. The violence against the Japanese was starting to damage China's reputation as a place to do business and the Sony Corporation had begun to shut down some of its plants in China. The campaign may have also backfired in terms of Japan. There will soon be new elections in Japan, with the nearly certain prospect that Japan's Liberal Democratic Party will return to power after a three-year hiatus. One of the leading contenders in shapes up to be a five-man race for the party's leadership is Shinzo Abe, a former prime minister who sought to upgrade Japan's military profile and jettison the legacy of the postwar settlement relegating Japanese Armed Forces to a purely self-defense role. Abe has accused the current government of Prime Minister Yoshihiko Noda of being overly conciliatory and claimed that China, by failing to protect Japanese nationals, had voided its membership in the international community. He contrasted the safety of Chinese nationals in Japan with the predicament of Japanese citizens in China. The real reason for the retreat however may be internal. The history of the Chinese communist regime is studded with examples of popular campaigns that have gotten out of hand. Party activists, when they sensed a mood emanated from the top, sometimes overzealously competed with each other to see who could achieve the most dramatic results. Demonstrations in hundreds of cities become a problem of control. Once the populace is mobilized, it's not a simple matter to demobilize it and having sensed their power and freedom of action, they could possibly turn their energies to targets that the party does not want touched - most notably, the party itself. The logic of the one-party state is that the Chinese people are not yet ready for competitive party politics. The politics of control and tutelage clash at some point with the spontaneity of demonstrations and people power.